I just got done reading an interesting thread about 'Exercising A Bow' between scrapings while tillering. It was a great thread in that people described their methods in detail. And, I found that to be very informative - Thanks for that. So, from that thread, where some guys talked about "Floor Tillering", I would like to hear more details on how one goes about floor tillering. While floor tillering, how do I know when the bow is bending enough to put the long string on it? Please don't tell me to "just look at it bending", because I do look at it while floor tillering, and, I still can't see. I don't know what to look for. Recently, I screwed up a really nice White Ash stave because, by time I got around to stringing it, the thing was nearly to weight at my intended draw length and the tiller was way off. I hope this question brings in some detailed descriptions / explanations from some of you guys who have been at it a while. I use floor tillering when I'm roughing out a bow, but I bend it over my knee to check if it's bending enough (or near enough to the final draw weight) to brace it. I was impressed to see that some guys have such a good eye that they can brace a bow after floor tillering only. "Floor tiller to full draw" must be a skill that requires special traits that you are born with. Personally, after many bows, I still cannot judge the weight of a bow (or the symmetry) simply by floor tillering. you just gave part of the lesson. Go to long string pretty early in the process. You really can't go wrong in going to the long string too early. It will just be so stiff it won't flex and you can take off wood slowly.until it does and then get into making it curve when flexing. If on the floor, you push in the middle of the bow and you see the middle part of the limb staying extremely stiff, you know some more wood needs to come off. I go to long string tillering very early in process, If it's much too heavy still (you'll know 'cos you'll have trouble pulling it) you'll know early enough, especially if you use weight gauge in your line. I thought floor tillering or using tiller tree was just for easiness and speed til you got some bending? 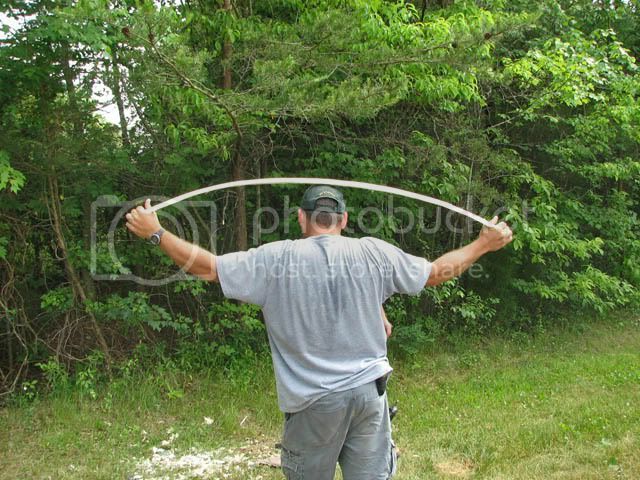 Just wondering, how did the native Americans or any ancient peoples tiller bows? Floor tillering is the first step to see how limbs are bending. I do use a mirror sometimes but mainly I use floor tillering to see the bend of each limb. For me it isn't an accurate look at the bend but it tells me its time for the long string. Just like a long string isn't an accurate look at true tiller it shows me that the limbs are bending somewhat together and then I know I can brace the bow low(about4") so I can see how the string tracks. If one limb is way out of whack I go back to the long string until the limbs get closer. "Just one more bow, OK?" Wallynosocks, THANKS FOR ASKING about the Native ways of tillering. I have often wondered about that myself. I can picture the braves sitting around scraping saplings, but not doing the "scientific" tillering we all engage in. I hope someone has some historical knowledge and will share it here. A complete record of the way Ishi made his bows and arrows exists (somewhere). I wish I had access to it....maybe it's in a book somewhere and available for purchase? I dunno. The workmanship of Ishi was by far the best of any Indian in America; compared with thousands of specimens in the museum, his arrows were the most carefully and beautifully made; his bow was the best. 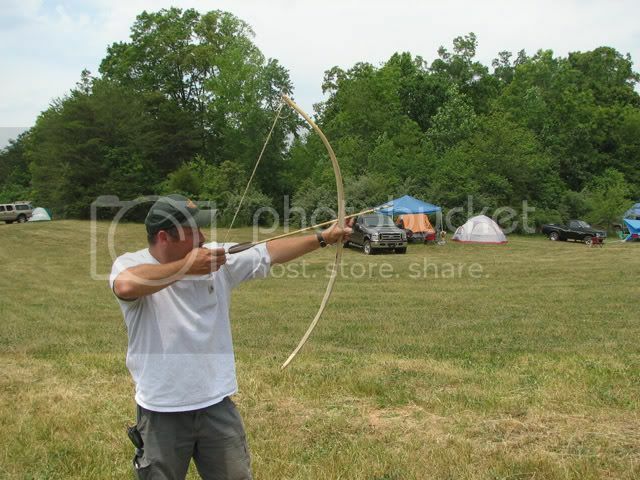 -The skill of bowmaking was learned from a very young age and by the time an Indian was an elder, he had probably made hundreds of bows and probably didn't need to spend much time on tillering. -War bows (and arrows) were often made by elders...not necessarily the braves. -The knowledge was passed on and not re-learned over and over again. the description given for ishi's practices are just very general. to his mind (as it was described), the bow should bend in an even "arch at all points". when the bow was thinned out and shaped ishi would apply sinew, at which point the bow would be left for some period of time to dry. 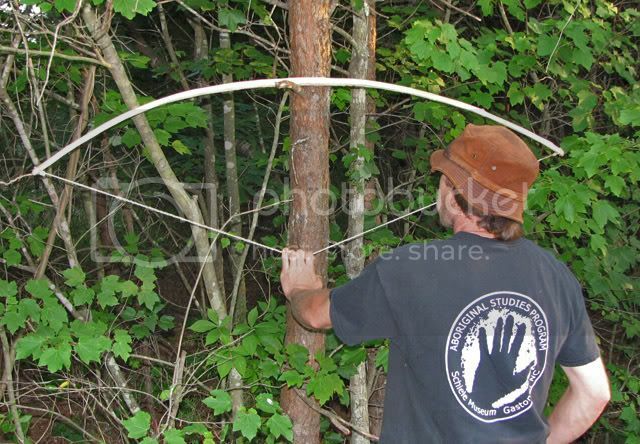 during this time the bowstring was made. when the bowstring was done, and the sinew backing had been drying for some reasonable amount of time, the bow would be braced. Not too hard to figure out ways to tiller without modern gadgets. Here's one we built completely with stone tools at a shoot last year-3 days including cutting the tree down and scraping a deer hide down with a stone scraper to make the string.